Eleven hours later, SHINee found themselves traipsing around the airport looking for their luggage, half asleep. It was nearing midnight - far past their usual bedtime. They had met up with a big brute of a man with a deep English accent and wore large sunglasses, even though it was dark outside and inside the building. He claimed to be their new assistant. “This way,” he had said as they had gotten off the plane and found themselves in a completely new environment. Although they had been to the same airport only last year for a tour, the whole place seemed foreign and unfriendly to them. Now the five of them were in a large room, ready to claim their baggage. Minho was already standing in front of the conveyor belt and was the first one to find his bag. He dragged it across the room to where the assistant was standing. Key and Jonghyun soon had their suitcases too, and the three SHINee members were standing awkwardly next to the assistant. Onew was stood by Taemin, scratching his head. "Do you know what my suitcase looks like?" Onew asked, looking clearly frustrated. Taemin forced a laugh as he waited for his own luggage to show up. Ten minutes later, all five of them had successfully located their suitcases and were wheeling them out of the airport. Onew was stifling yawns every few minutes - everyone&apos;s eyes were drooping. "Into the cab. The drive to the hotel is only fifteen minutes from here," the man said, directing them to the black car in front of them. Key was too tired to object and tell the man of his cousin, and ended up getting in the same car as Onew, Taemin and Minho. Jonghyun was forced to follow, unsure of what to say. And sure enough, they soon found themselves in a warm and cosy hotel, checking into their prebooked rooms. "Room number 103," the man behind the desk said, handing Minho a key. Soon Minho and Taemin were racing towards the stairs, and then already out of sight. "And room 105." Jonghyun happily took the next pair of keys from the man&apos;s hand, and was also starting his way up to the second floor. "Wait, what about Onew?" Key said, glancing towards their leader who was resting against his suitcase with his eyes halfway closed, barely awake. "He can sleep on the floor," Jonghyun said wearily with a hint of a smile. "We&apos;ll sort everything out tomorrow." Key noded in agreement before tapping Onew who was almost snoring and helping him with his suitcase up the stairs. That night, they decided that none of them cared where they slept - Jonghyun and Key were to share a single bed that was obviously meant for Onew who instead ended up having to sleep on the small couch. Minho and Taemin were in the bedroom next door, which supposedly had two single beds. Jonghyun could hear them giggling from down the corridor. "How are they still awake?" he sighed, knocking on their door as Key and Onew dragged themselves into their room which was just down the end of the corridor. "Taemin? Minho?" But the giggling stopped abruptly, and a few moments of silence later, Jonghyun could hear the rustling of clothes and faint footsteps which disappeared shortly after their appearance. Jonghyun shrugged - he was too tired to deal with whatever they were doing. And as long as they didn&apos;t disturb his own sleep, he didn&apos;t mind. Jonghyun left them and followed Key and Onew into his room. Onew was already flopped on the couch with his clothes still on, evidentally already asleep from the soft snores. Key was in the bathroom, wiping off his makeup and eyeliner that had smudged under his eyes. "I can&apos;t believe you didn&apos;t tell me about my eyeliner!" Key whined as Jonghyun stepped into the bathroom to join him. "I look such a mess." He continued to wipe off his makeup in front of the sink, eyeing himself in the mirror. "You look fine," Jonghyun said, yawning. He wrapped his arms around Key&apos;s waist, whispering into his ear: "Come to bed. I&apos;m tired." 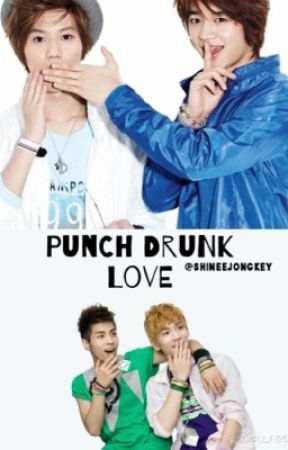 Key huffed in annoyance, but eventually gave in as he saw Jonghyun&apos;s face - he couldn&apos;t resist. "Tae, hurry up! If you wan&apos;t to cuddle sooner you have to get dressed much faster than that," Minho half complained, wanting to be close to his boyfriend again. He had already gotten into the comfortable bed, and was waiting for Taemin who was in the bathroom. "I&apos;m coming! Hold your horses, Minho," Taemin joked as he ran back into the room, clad in his boxers and a white t-shirt. "What took you so long?" Minho whined and Taemin rolled his eyes, climbing into bed next to Minho, snuggling up to his chest whilst Minho wrapped his arms around Taemin&apos;s waist. "I was rubbing off my makeup from earlier; it sure does stay on well... Even with water." "That&apos;s why waterproof is called waterproof, Taeminnie," Minho teased and Taemin flushed red in embarrassment. "Shut up," he mumbled softly, cuddling up to Minho&apos;s chest. "Turn the light off, let&apos;s sleep." "Yeah," Minho agreed and clicked off the small bedside lamp, before once again returning to the warm, inviting arms that were his boyfriend&apos;s.
But Minho couldn&apos;t help but ponder over who was talking about them and what was being said about them back in Korea. Even if this holiday was supposed to turn the attention away from the leaked photos, Minho couldn&apos;t help but feel it would only make things worse being away from all the drama.